Good morning and welcome to this month’s Stitching Focus! I’m Lizzie Jones, your Stitching Ambassador and I am so excited to be here sharing with you today! I shared a photo on Instagram last week of my travel stitching box and I got so many questions about my needle book and scissor keeper that I thought I would share a new set today. I’ve been wanting to make a second set to keep in my travel box anyway, so this seemed like the perfect opportunity! But first, let’s take a closer look at the dies I’ll be featuring today. 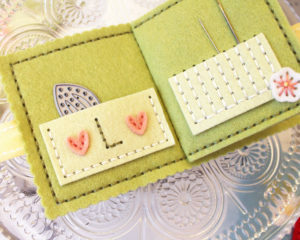 Let’s start with a closer look at the Sewing Staples: Needle Book Die Collection. This die collection includes a straight edge page (or cover), a scalloped edge page (or cover), and a variety of pockets and needle minders that you can use to customize the pages of your book. The pockets are ideal for holding onto a threader, flat thimble, or other small accessories. The needle minders keep a variety of needles at the ready as well as corral your pins so they’re always convenient. I love mine and use it all the time! You can find Erin’s original introduction video HERE for help with assembly and design ideas. Erin used the scalloped cover to create a set of mini notecards. She decorated them with small blooms and a grid background to make them all-purpose so they’ll come in handy for any occasion. 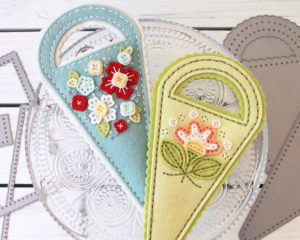 The stitching adds such a whimsical detail and so much texture to these itty-bitty creations! I used the Sew Stylish Alphabet 1 Die to add a monogram to my needle book. The Floral Cluster flowers are such a wonderful embellishment! 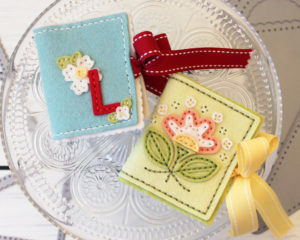 Rebecca‘s tag booklet is the perfect way to gift a batch of handmade tags to a loved one. 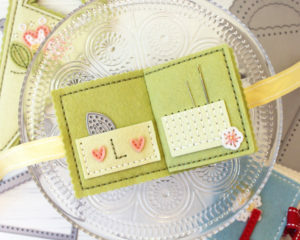 She used a hook and loop closure to keep the booklet securely closed and embellished with a layered felt flower to give her cover a little pizzaz. 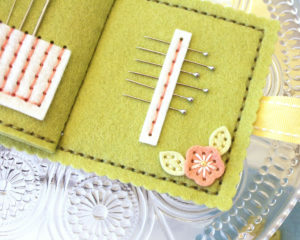 Erin created a photo keepsake by pairing the Sewing Staples: Needle Book with the Stitched Frame Die Collection. She even embellished the cover with the Seasonal Stitching: Apple and personalized the inside with her son’s name and grade level. This would be such a thoughtful gift for some proud grandparents! 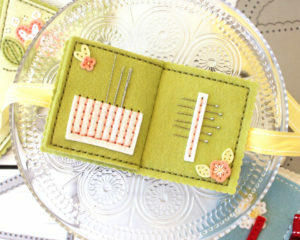 Tracy‘s needle book incorporates so many bright colors of our fabulous wool felt. And the Floral Cluster flowers add such depth and dimension. Hilary created her mini cards by layering the straight and scalloped edge covers for a sweet peek-a-boo effect. She even used the stitched lines (designed to hold the needle minder in place) to create flower stems for her Floral Cluster flowers. So clever! And the mix of felt and cardstock gives these little cards so much more character than if she had just chosen to go with one or the other. 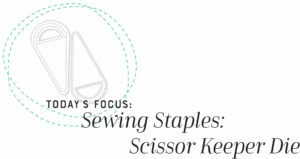 Next up in this month’s spotlight is the Sewing Staples: Scissor Keeper Die. It is designed to keep your sharp sewing scissors safely secured, but its simple shape is fantastic for so much more (I dare you to say that sentence five times fast). It coordinates with the gorgeous Sewing Staples: Floral Cluster Die, but can also be paired with monograms or other Seasonal Stitching designs for even more options. You can find Erin’s original introduction video HERE for help with assembly and design ideas. Erin trimmed off the handle of these Scissor Keepers to create sweet, seasonal flags. She adorned the flags with the Seasonal Stitching: Butterflies, Eggs, and Clovers to celebrate Spring. A hidden cardstock core keeps her flags flying high on her little dowel rod poles. Clever! Tracy used just the straight edge die to create her scissor keeper. The Sewing Staples: Floral Cluster looks stunning in cool colors against a Smokey Shadow background. She even added a tiny ribbon tag for a bit of extra flair. I used the Scissor Keeper to create some food-shaped catnip toys for a couple of very spoiled felines. The Stitched Circles turned out to be perfect for pepperoni pizza and the Pinking Shears Border Die made for some very convincing blueberry pie lattice. Erin also created this tussie mussie style lollipop holder to tie to a birthday gift bag. She used 2015 Birthday Tags and the Limitless Layers: 2 1/4″ Oval Die Collection to create a sweet focal point on her pocket. A little crochet thread is all that she needed to tie her treat to the bag’s handle. Erin‘s chicken scratch scissor keepers have a classic meets modern, homespun quality that is absolutely delightful. On the aqua version, she snipped off the handle to make it even quicker and simpler to sew together while the pink version boasts pretty scallops and that wonderful pop of color. Rebecca turned her scissor keeper into a flower pouch by lining the interior with a bit of wax paper. She used Floral Cluster blooms to add a soft, botanical element while the deep purple stitching adds an elegant contrast. As I mentioned earlier, I have been wanting to make a second needle book/scissor keeper set so I can have one in my studio and another to take with me when I’m traveling. I wanted the new set to be a little different than the first, so this time I paired the Sewing Staples dies with the Stitched Folk Flower Die to give both pieces a decorative element. I also wanted to go with a completely different color scheme this time around, so I used Spring Moss and Simply Chartreuse as the foundation with pops of Melon Berry, Harvest Gold, and Vintage Cream thrown in for good measure. Let’s check out all the details of the needle book first. I also want to show you this new needle book next to my old one so you can see how well the felt has held up over the past three and a half years. Here they are together. You can see that the felt on the older needle book has held up remarkably well. The new one is a little stiffer than the old one, but it will loosen up as I handle it more and more. Like I said, I used the Stitched Folk Flower to decorate the cover this time around. I love that this flower design has both embroidered elements as well as layered pieces. Inside the needle book, I used a pocket that I can use for a threader or brooch pins or a baggie of beads and sequins. The other page features a needle minder and a flower that I cut with the Floral Cluster Die. I used the Small Stitched Alphabet to monogram the pocket. The hearts are actually leaves from the Floral Cluster. Isn’t it great when a small die can do double duty like that? 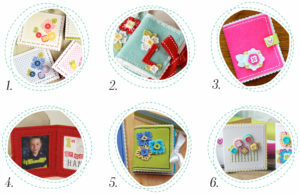 The next two pages feature another needle minder and a pin corral. I can never have enough needles at my disposal. This way I can swap colors without having to thread and rethread my needle. I used more of the Floral Cluster flowers to dress up these pages and I used Harvest Gold Saddle Stitch Ribbon (stitched into the cover) to tie the book closed. And of course I needed a new scissor keeper to match! Here are my two scissor keepers together. I used the same color palette on the scissor keeper as the needle book. I used both the scalloped and straight edged layers together. I love that contrasting scalloped edge! 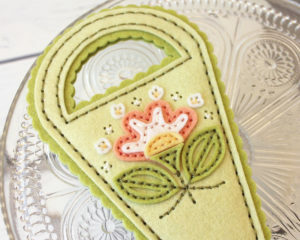 The Stitched Folk Flower fits perfectly on both the scissor keeper and the needle book. I am so tickled about how these turned out. I can’t wait to start using them! Thank you so much for joining me for today’s post. 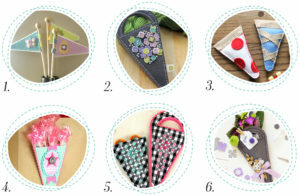 I hope you enjoyed it and are inspired to create your own needle book and scissor keeper set. Have a great day and I’ll see you again soon! Oh, my goodness, how cute are these!!? Love all the colors you used, and the details are darling!! Gorgeous Lizzie! Love the Stitched Folk Flowers flowers on your new set and the color combo too! I like the colors you chose. Have you considered a smaller version of the scissor holder? This one is way to big for my embroidery scissors. If they had some of the other stitching dies in stock (especially the holiday ornaments), I would totally get on board with this. It’s so very cute! Love the old ones & the new ones! Beautiful work, Lizzie! Wish you were here to do a felt stitching class! These are lovely! I didn’t remember you could get these dies, thanks for the inspiration! 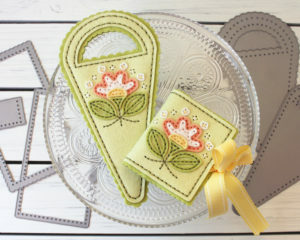 I love seeing how the folk flower fits on the needle book and scissor case. Your color choices are beautiful! I’ll add my thank you to Susan’s for the early release of your new ornament dies. I’ve made several, and they stitch up perfectly!